tspsc.gov.in Telangana Departmental Tests Results 2017 Download EOT,GOT,Spl Lang Tests Nov, May Session 2017. 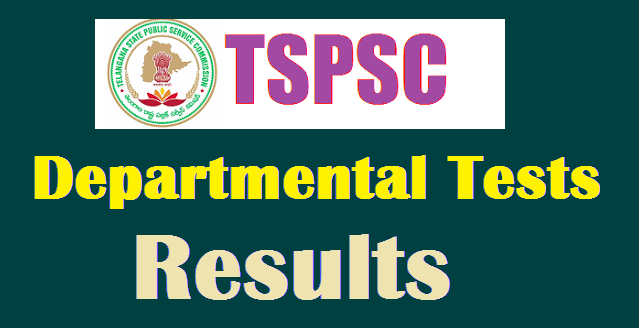 TS Departmental Test Results 2017 / TSPSC Departmental Test Results 2017 TSPSC Departmental Tests 2017 Results| November, May 2017 Session Results| tspsc.gov.in TSPSC Departmental Tests session wise Results, TS Departmental Tests May/ November Session Results 2017,Departmental Examinations results,Telangana Departmental Tests 2017 Results session wise , TSPSC Departmental Tests 2017 Results, EOT(Paper Code:141), GOT(Paper Code:88&97), Telugu Special Language Test (Paper Code:37) 2017 Results, tspsc.gov.in results #TSPSC Departmental Tests Session wise (Official Gazette Bulletin) LIST OF SUCCESSFUL CANDIDATES List with names& designation also available here. Telangana State Public Service Commission (TSPSC) has Recently completed the Departmental Tests Examination at 25-05-2017. the Candidate who have appeared for the exams are now eagerly waiting for the Results 2017. TSPSC Departmental Tests Result 2017 will be available in the official website. Now all Telangana State Public Service Commission (TSPSC) Departmental Tests Exams Attended Candidates are eagerly waiting for the declaration of exam Results 2017. This TSPSC Departmental Tests Examinations Results 2017 are expected to be declared in month of Jun 2017. Dear Candidates who are going to appear for the exam can check their official website.